What to Wear to a Kentucky Derby Party ~ Roses and Rain Boots . One of the main reasons I love the Kentucky Derby is because it is a great excuse to dress up. Even if you aren't going to the actual Kentucky Derby dressing up makes watching the race more fun. This coming Saturday I will be attending a Kentucky Derby Party with some friends and a hat is a must. 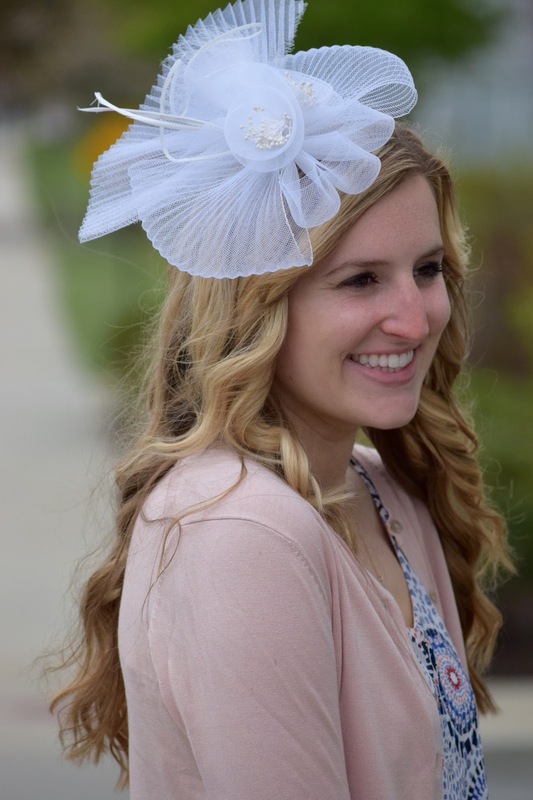 When I sent my friend a sneak peak of today's post she told me "I reminded her of a blonde Kate Middleton" Now besides being one of the nicest compliments it inspired my interest in discovering the history of the traditional "Kentucky Derby hats." After some researching, I learned that Lewis Clark the founder of the Kentucky Derby was actually inspired by the posh and elegant style present at the London's Derby. This then inspired him to bring that same style to the American racetracks. I guess my bestie was on to something! Now whether Lewis invisioned feathers and flower galore is unknown, but nonetheless, Lewis inspired to create an even that was as big of deal as a cocktail party or ball. And as a result, the attire of guests in attendance at the Kentucky Derby soon became as prominent and important as the races themselves. Which brings me back to my main point, when dressing for the Kentucky Derby be sure to wear what makes you feel great and hats are always a must! I am so excited that I stumbled upon this chic headband from Burlington Coat Factory. Thanks to one of my Style Collective Sisters who recommended the store, it is now my go-to for trends I want to try at an affordable price point. Just you wait until you hear the deal I got on this head band. I actually couldn't get the headband into my cart fast enough. This wasn't at all what I originally planned to wear. I thought I wanted a big colorful hat but then I saw this headband and knew that it would go with go with basically anything. I have thought about adding some more decorations to it for the actual party, so be sure to follow me on Instagram to see pictures from the party. In addition to a hat, a good summer dress is essential this time of year. They are such a staple and you can never have enough, they are perfect for summer parties, wedding showers, etc. On days when I feel like I have nothing to wear I pick a cute summer dress, grab a matching cardigan and my favorite wedge sandals and I am good to go. Dresses instantly make me feel more chic, feminine and classy. 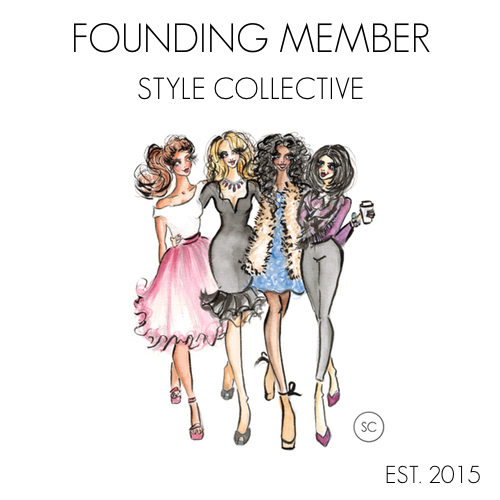 Don't forget you can subscribe to Roses and Rain Boots via email so you never miss a post! Your inbox is about to get a lot more stylish. Cute outfit! You look so pretty! I love this look so much! 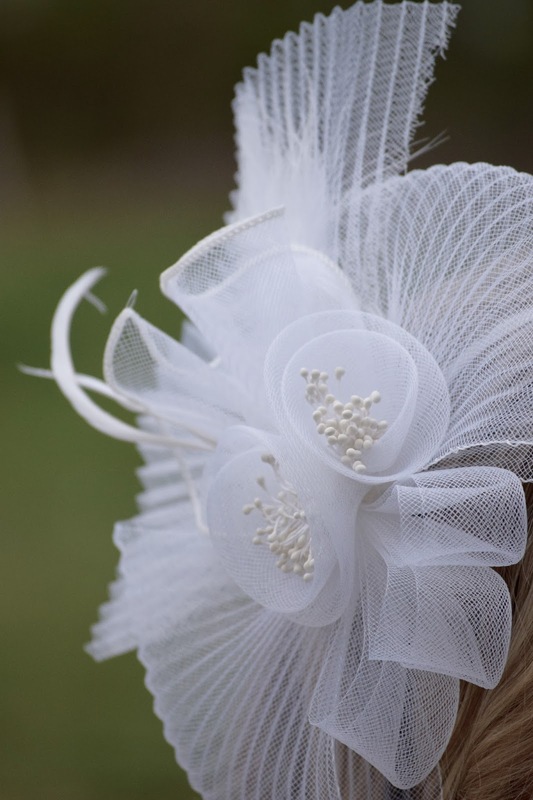 The delicate patterning in the dress and the textures in your fascinator are perfection! What an adorable look! And that print is to die for!! What a cute post!! 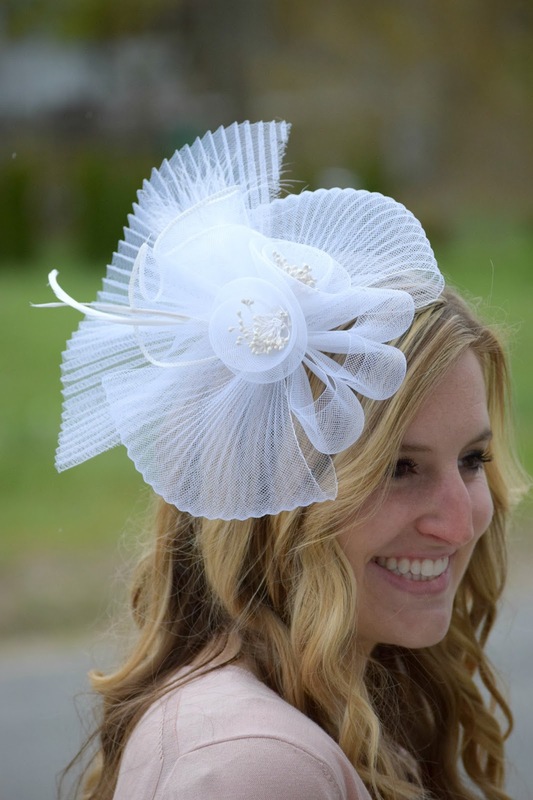 I am loving this fascinator on you and that dress! Xo! Oh my goodness! How cute! In college I used to go to the Carolina Cup every year in South Carolina. It was always a huge deal to find an affordable hat that stood out. A head band like this would have been so much easier! This is adorable :) Love the headpiece. How fun! Love the look. So stinkin' cute! What a cute derby hat! Have a great time at the party! I look forward to the pictures. You look like a Royal in that fascinator! So cute. Have fun, girl! As a southerner, I love the Kentucky Derby. I am not able to attend this year, but I have gone in previous years. Iroquois Steeplechase is also a big thing around here since it is in Nashville. I love an occasion to wear a hat, and the bigger the better in my opinion. Your outfits are always so adorable, extra jealous! So fun! I'd love to dress up and go to a Kentucky Derby!